Sounds like a great trip Dave. I look forward to hearing a full report. Not at Tadmarton this Sunday though as on Saturday I'm off to Italy on the bike - a modern Triumph Tiger 800 I'm ashamed to say! My dear fellow, I'm bolstered by your safe return and enthralled with your wonderful images but slightly confused by the apparent grafting of a Sportster seat onto the otherwise rather conservative GT? 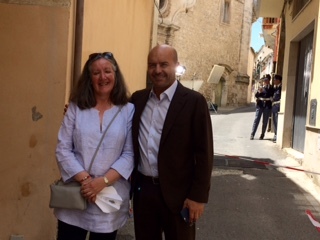 My wife and I met this friendly gentleman while we were in Ragusa. Stanard seat base Phil,overstuffed by the previous owner then squashed by the over enthusiasm of the ferry crewman who ratcheted the bike down. The stuffing has failed to recover.